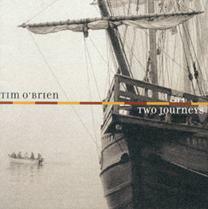 George Graham Reviews Tim O'Brien's "Two Journeys"
Though it might not seem obvious, there is a connection between Celtic music and American country music that extends far back in time. Many of the early settlers of the Southern Appalachians came from the British Isles and brought with them their folk music and their fiddles. Of course, the musical forms diverged enough that for many, the idea of a country/Celtic connection seems a bit of a stretch. But in recent years, there has been some interesting cross-pollenization going on with artists from Nashville and Dublin collaborating. Irish-born singer Maura O'Connell made a series of recordings in Nashville with bluegrass musicians, and American singer-songwriter Nanci Griffith worked with the Chieftains. This week's album is another worthy project involving musicians from both sides of the Atlantic to create music that is almost equal parts bluegrass and acoustic country on the one hand and Irish-Celtic on the other. It's the new recording by veteran singer-songwriter Tim O'Brien called Two Journeys, and it's his second such transatlantic project. The West-Virginia born O'Brien first came to prominence as the mandolinist in the Colorado-based bluegrass band Hot Rise, in which he played an increasing role writing original material for the group. He began releasing a series of solo albums, and eventually moved to Nashville, where his songs have been recorded by several on the country music scene. Perhaps inspired by the work of Maura O'Connell, and also interested in establishing a connection with his family's ancestral home, O'Brien travelled to Ireland and began collaborations with musicians there. Two years ago, he released The Crossing, the result of that musical journey, consisting of mostly his interpretations of traditional Irish music. Two Journeys is a recording on which the influences from each side of the Atlantic are more closely integrated with each other. It's about equally divided between original material by O'Brien and traditional music, and every track features both Nashville musicians and Irish players. And yet the musical direction is quite consistent, rather than sounding like one Irish tune, then a bluegrass tune, the influences are mixed in every piece. There is even a little Cajun influence in the blend with the connection that some of the French immigrants who became the Arcadians, then the Cajuns in Louisiana, came from regions of France, like Brittany, with some Celtic influence as well. Among the numerous guests on Two Journeys are drummer Kenny Malone, bassist Dennis Crouch, and guitarist Darrell Scott, active Nashville session musicians all, plus fiddler Kevin Burke of the Bothy Band, and accordionist John Williams and vocalist Karan Casey, both members, or in the case of Ms. Casey, recent members of the remarkable Celtic band Solas. O'Brien is no slouch himself on the mandolin and its various instrument cousins, and he very much acquits himself on fiddle throughout this rather generous CD. And as much of a distinctive and personable singer O'Brien is, six out of the fourteen tracks are instrumentals. Interestingly, with as many hot pickers as there are, most of the instrumental jigs and reels are taken at a fairly leisurely tempo. Tim O'Brien's new CD Two Journeys is the Nashville-based songwriter's second venture into Celtic music, though stylistically this CD lies metaphorically in the middle of the ocean, with as much American as Irish influence. That is also reflected by the recording's personnel, about equally divided between Irish musicians and Nashville-based pickers. They play quite well together, even though on some the tracks, the Irish musicians overdubbed their parts in Ireland while the rest of the CD was made in Nashville. O'Brien is a first-rate songwriter, but he also draws on both traditional material and interesting contemporary songs to make up this very tasteful album that is both pleasing to listen to, and also full of musical substance. O'Brien's liner notes on each song are also a plus. Our sound quality grade is, unfortunately, no better than a "B." The mix is rather good, and the acoustic instruments are reasonably well-recorded, but the CD suffers somewhat from a compressed, restricted sound that gives the music a relatively "squashed" quality that loses the dynamics of both the instrumentation and the vocal performances. Given their distant but tangible connections, Celtic music and old-time American country and bluegrass have until fairly recently generally kept their distance. But Tim O'Brien's new CD builds on those connections to create a satisfying listening experience.